The “success” of the blitzkrieg war in Iraq has been difficult to duplicate in Afghanistan, “the heart of darkness”, one British commander quipped to his troops as they went into battle, despite dropping far more bombs — many of them radioactive. The unflagging resistance of the Afghans, their refusal to submit to the occupiers, is that because they realise the invaders are not there for their purported altruistic motives. The thousands of civilians and resistance fighters who have been killed by airstrikes — none of them guilty of anything more egregious than defending their homeland — is more than ample proof, as is the craven propping up of a US-imposed government, and the proliferation of US bases in the country. The unapologetically un-Islamic ways of the invaders, their lack of even the remotest understanding of the people they are occupying, is a constant insult to a proud and ancient people. The new exit plan, so it goes, involves “clearing” all regions of Taliban — US Marines call it “mowing the grass”, acknowledging that as soon as they murder one group of resisters and leave, more pop up. The “new” strategy is to bring in ready-made Afghan administrators and police to create a prosperous, peaceful society once the “enemy” have been destroyed, “winning the hearts and minds” of the locals. 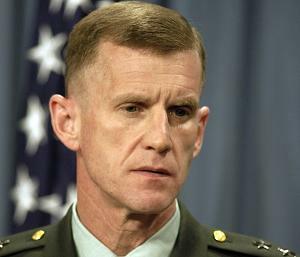 “We’ve got a government in a box, ready to roll in,” said chief honcho General Stanley McChrystal. But wait a moment. Is it possible the invaders are the enemy? And who are these newly discovered Afghan officials? Are (famously corrupt) Afghan government officials and police nominally loyal to NATO forces, trucked in by the invaders, going to be welcome in remote villages as ready-made trusted representatives of the people? And wasn’t this precisely the failed policy the US followed in Vietnam ? This old “new” policy was what convinced United States President Barack Obama to go along grudgingly with the Pentagon’s demands to radically increase NATO force — though on the condition that the whole operation be complete by next year. He clearly was given no choice in the matter, and his “ultimatum” was dismissed by US Secretary of Defence Robert Gates moments after Obama made it. Not surprisingly, NATO forces have met strong resistance in Marjah as their onslaught enters its second week, from both the incredible, ragtag resistance and from locals, who doubt that the postwar reality will correspond remotely to the picture the invaders are painting. Tribal elders in Helmand this week called for an end to the “Moshtarak” offensive, citing Western troops’ disregard for civilian lives. Realising their “shock and awe” bombing kills civilians and turns locals against them, the invaders have reluctantly cut back, now authorising them only under “very limited and prescribed conditions.” Even so, over 50 civilians are among the dead so far — 27 in an airstrike in Uruzgan Province — and “friendly fire” killed seven Afghan police. Six occupiers were killed in one day alone, bringing NATO losses to 18 at the time of writing. The latest propaganda ploy is to accuse the Taliban of using locals as “human shields” and of holing up near civilians. But surely it is the NATO forces that are using locals as human shields, invading their homes in search of the “enemy”, forcing them to betray their children and friends, often under torture in Afghan-run prisons. Even those Afghans who collaborate with the occupiers, taking their dollars, guns and uniforms, are in effect human shields for the troops. And when they realise their lives are on the line, they flee their paymasters. How else to explain the 25 police officers who left their posts last week and “defected” to the Taliban in Chak? But Marjah is really just a microcosm for what the US is doing at this very moment around the globe — waging a veritable war on the world, in Iraq, Pakistan, expanding into Yemen, Somalia, Iran, supplementing bombs and soldiers with militarised sea lanes, forward military and missile bases on every continent, encircling “enemies” Russia and China. The process is merely accelerating as the US loses its traditional edge in the world economy, outpaced by China . It is the logical next step for a deeply illogical economic system. It can’t be repeated too often: the US is frantically trying to consolidate its sole superpower status militarily before it loses the economic war. Today’s Russia, unhappy with the Yelstin-era acquiescence to a subservient role in the US empire, is the only country standing up to the US empire. The new military doctrine announced by Russian President Dmitri Medvedev earlier this month is unwavering in its condemnation of US plans. The fact that NATO is attempting to “globalise its functions in contravention of international law” is threat Number One, followed by NATO’s encirclement of Russia and US forward missile bases, now rapidly being deployed around the world — and Russia. International terrorism is ninth out of 11 threats listed. Prime Minister Vladimir Putin reiterated this on Tuesday, saying Russia will give priority to nuclear deterrence, space and air defense in its military reforms. The Russians argue that the OSCE should have been the vehicle for European security after the collapse of the Soviet Union, but instead, the US chose to expand NATO. This meant not uniting Europe, but merely moving the dividing line east, Russian Foreign Minister Sergei Lavrov said last week at the Munich Conference on Security. Lavrov pointed to the bombing of Yugoslavia in 1999 and the tragedy in the Caucasus in August 2008 as evidence that the OSCE had failed to rise to the challenge of maintaining peace in Europe . The OSCE Permanent Council knew about the Georgian leaders’ preparations for a military attack but took no measures. The Russia-NATO Council also failed when members blocked Russia’s request to convene an urgent meeting when the military actions were at their height. Last month’s London conference on Afghanistan was presented in the West as a benign effort to provide economic development and humanitarian aid. It was not a UN conference, but “the international community coming together to fully align military and civilian resources behind an Afghan-led political strategy”, graced by the UN secretary general’s presence. It was preceded by two days of meetings between top military commanders of almost a third of the world’s nations at NATO headquarters in Brussels, and followed by two days of meetings by NATO and allied defense chiefs last week in Istanbul, the latter attended by Israeli Chief of General Staff Gabi Ashkenazi. The brazen involvement of Israel in a war against Islamic Afghanistan, where Israeli drones have killed and continue to kill civilians and resisters, suggests what this war really represents. The invaders should note that their nickname “Moshtarak” (collective) derives from the same Arabic root as shirk (idolatry). Though Pentagon planners don’t register such subtleties, the locals surely do. Marjah is indeed Fallujah. Like Fallujah, it will become a symbol, the defining moment in the war against the Afghan people. US Marines may “mow the grass”, eradicate the “weeds”, and plant their sterile seeds of Western-style democracy and economic prosperity as much as they like. However, “the Taliban is the future, the Americans are the past in Afghanistan,” as former head of the Pakistani Inter-Services Intelligence Hamid Gul recently told Al-Jazeera. This is clear to any sensible observer. Gul angrily notes that it is Afghanistan ’s neighbours, in particular, Pakistan, that will be left holding the bag when the inevitable arrives. “The OIC and the Muslim countries will have to come in and play their part. Then Afghanistan can redeem itself.” The sooner the US accepts the inevitable, the fewer will be the needless deaths of both Americans, Europeans and Afghans.